It’s always nice to get a dessert that is homemade, but who has time to make anything? Nothing eats up time more than making dessert. 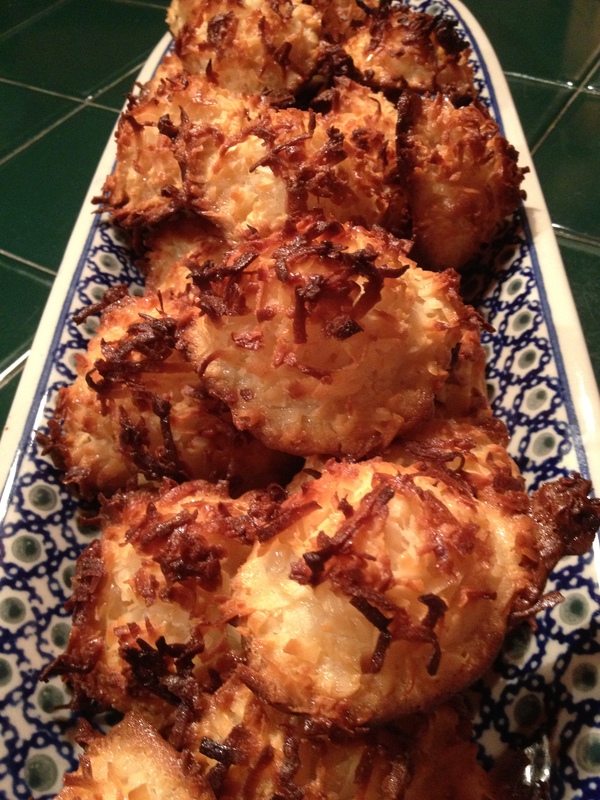 Whenever I need a last minute course to round out a dinner but i find myself out of time and energy (not to mention I don’t want to go back to the supermarket), I make Lucy’s Favorite Coconut Macaroons. Five simple ingredients that you can keep in your pantry. A large bag of coconut flakes (14z), a can of condensed milk, 2 eggs (just the whites), vanilla extract and salt. You want to keep it really easy? You’ll need some parchment paper for the cookie sheet and a medium ice cream scoop. It’s neater and faster than spooning out the mix. Just get a big bowl, mix the coconut with the condensed milk and the 1T of vanilla. Beat the egg whites with the 1/8t of salt and form stiff peaks. Fold in the egg whites to the coconut mixture. Scoop them out on 2 parchment lined cookie sheets. Put the 2 cookie sheets in the middle and upper parts of a 350 degree oven. Bake for 12 1/2 minutes. Then rotate and switch the 2 pan positions (the top to the middle and the middle to the top). Bake for another 12 1/2 minutes. Cool on a wire rack. Done! This is Steve R Morse in Fort Lauderdale with dessert in minutes. This warm chocolate budino desert is easy to make and looks like it came from a fancy restaurant. Credit goes to pastry chef Jennifer Dolence for this cross between cake and pudding. 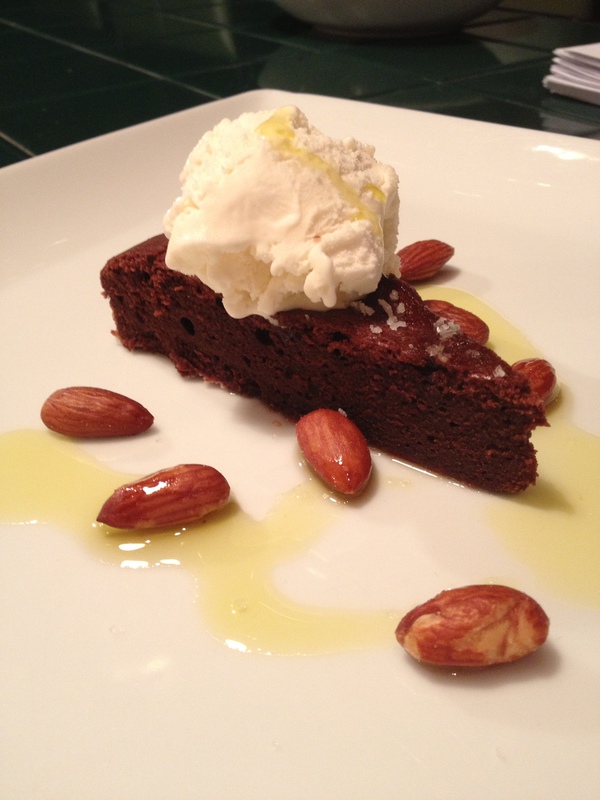 The subtle drizzle of fruity olive oil and the saltiness of the almonds crank this up a notch. You don’t need a mixer for this. Just a simple whisk. What I like about this dish is that it is not overly sweet. This is Steve R Morse in Fort Lauderdale adding a pound or two to your waistline. Preheat oven to 350. Butter and flour an 8″ round cake pan. Line the bottom with parchment paper and butter and flour the paper. In a small bowl, whisk the flour, baking powder and salt. Chop the chocolate and melt it with the butter in a microwave safe bowl. Whisk in the 2T of olive oil and the sugar. Whisk in the eggs. Whisk in the dry ingredients. Pour into the pan. Bake for 40 minutes by putting the cake pan inside of larger pan where you pour hot water 2/3 up the side of the cake pan (google bain marie, don’t worry, it’s easy). Let the cake cool 30 minutes. Invert. Take off parchment paper. Invert again. Cut and serve. I love making this dish as much as eating it. 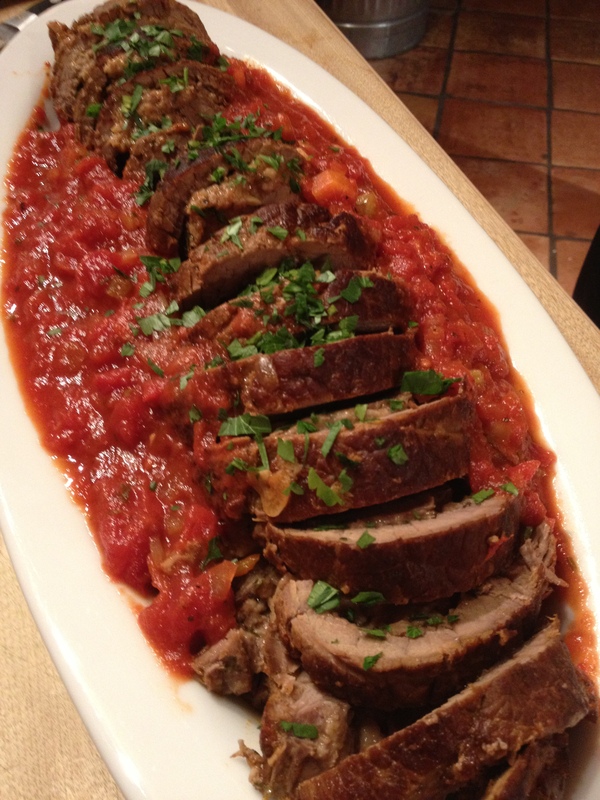 Braciola (also called Brascole) is one of those dishes that looks a lot more complicated than it is. Whatever you do, don’t buy the pre-cut pre-rolled braciola in the supermarket at the meat counter. It won’t come out the same. If you want to save additional time, use a good quality jar of marinara sauce. I made my own. After all, it is Sunday. What’s a Sunday without stirring a big long wooden spoon in a giant pot of gravy? You can use flank steak if you want. I use thinly sliced top round (it may be labeled as London Broil, even though that’s really describing the method of cooking, not the cut of meat) and it works like a charm every time. It’s a simple technique. I like to pound out the steaks even more when i get them. Then you generously salt and pepper them, sprinkle them heavily with your cheese and herb mixture (I like to use three or four different cheeses, but anything will do), tie them up, brown them in your dutch oven, cover with the marinara sauce and white wine, and cook them at 350 for 2 hours. It’s that simple. You can’t mess it up. So here’s your shopping list. Pair this classic Italian sunday dinner dish with a hearty Italian red such as a Barolo or a Ripasso. The ample tannins in the wine will cut right through the heaviness of the meat, cheese and sauce and will make this dish sing. This is Steve R Morse in Fort Lauderdale with an italian feast. Ciao! The other night we opened a 1995 Kalin Cellars Chardonnay. Most other chardonnays would have long since bit the dust, but the Kalin was suprisingly vibrant and vivacious. Beautiful aromatics and a lanolin texture were abundant throughout. Tasting a bit like quince and breakfast pastry, this is a most unique chardonnay. The best part – the most amazing long finish of any wine in a long time. At about $60, it’s definitely not an everyday house pour, but for those of you that want to try something completely different, this offering is sure to rock your boat. Pairing? The perfect pairing for this beauty is great conversation with a close friend. This is Steve R Morse in Fort Lauderdale digging deep in the cellar for this one. 2008 Pascal Jolivet Sancerre Les Caillottes – I had purchased a case of this pedigreed sauvignon blanc about two years ago, and the other day we just finished our last bottle. So sorry to see it go. My close friend PJ Rex was visiting from Deerfield Ranch Winery in Sonoma, so we did what we so often do when we get together, we get oysters and stone crabs and tuck in for the night. This is a great pairing. Along with Champagne and grand cru chablis, the sancerre makes the quintessential partner in this match. The Jolivet has a medium brightness with plenty of minerality and citrus dominating the nose and palate. Deliciously complex, but definitely a food wine (not a pool deck sipper), this aristocrat makes perfect use of neutral oak to develop beautiful phenolics and a long lingering crisp finish. I’ll miss it. This is Steve R Morse in Fort Lauderdale with another wine review. 2007 The Paring Pinot Noir – This is a relatively new offering from California’s Central Coast. This is about as far from “Burgundian” style as you can get. It is a massive pinot in the style of Oregon’s Patricia Green, or Sonoma’s Kosta Browne. The bottle itself is elegant, modern in style. Upon popping the cork, the aromatics are beautiful, showing a mix of strawberry and cherry with ample spice notes. Being that it is 95% Santa Rita Hills and 5% Santa Maria Valley, it is very similar to Sea Smoke’s The Southing, only more powerful. Hints of dark chocolate, licorice, cherry, plum and black pepper dominate the palate. A long, slightly hot cherry finish ends the ride. A great value at $35. I’m glad I bought a case. This is Steve R Morse in Ft. Lauderdale with another wine review. If you haven’t seen the movie, put it on your list. I gave it five stars *****. This is Steve R Morse in Fort Lauderdale with this week’s movie review.